Sacramento – The California Department of Corrections and Rehabilitation is formally opposing AB 1270, legislation that would increase transparency and media access to California’s notorious state prison system, citing cost as their main concern. “We do not share CDCR’s belief that increasing transparency in prison operations would have adverse budget consequences, as they suggested in their letter of opposition last week,” said Karen Shain, policy director for Legal Services for Prisoners with Children, a member organization of the grassroots coalition Californians United for a Responsible Budget, which is sponsoring the bill. The bill would restore reporters’ ability to request interviews, including recorded interviews, with specific prisoners, as existed before 1996. Current policies prevent recorded interviews, except in brief phone calls, and hinder reporters’ ability to monitor prison conditions and CDCR’s expenditures of billions of tax dollars. The legislation requires CDCR to respond to requests within a 48-hour period and would protect against any acts of retaliation by CDCR for speaking with the media. The bill is currently on suspense in the Senate Appropriations Committee. Past versions of this bill were always estimated to cost well below $150,000, the Senate suspense file threshold. Previous analyses of identical bills showed these costs would be absorbable even if the current average of 200 interview requests per year increased five times. “Although I understand that state agencies must be prudent with expenditures, this measure has historically had minor and absorbable costs. It is unfortunate that CDCR has presented this as the primary reason to oppose a much-needed sunshine measure that would strengthen institutional transparency and invite more public accountability,” stated Assemblymember Tom Ammiano of San Francisco, author of AB 1270, the most recent version of the bill to gain more media access in state facilitates. Several versions of the bill have passed the legislature; Governor Schwarzenegger vetoed the most recent version in 2006. The current bill was introduced after reporters were denied access to prisoners on hunger strike in Pelican Bay’s Segregated Housing Unit last summer. The bill has already passed the Assembly 47 to 22 and the Senate Public Safety committee last month. AB 1270 is sponsored by California Coalition for Women Prisoners, Californians United for a Responsible Budget, the Center for Young Women’s Development, the Friends Committee on Legislation of California and Youth Justice Coalition. AB 1270 is supported by Legal Services for Prisoners with Children, California Broadcasters Association, California Public Defenders Association, American Civil Liberties Union of California, California Catholic Conference, California Newspaper Publishers Association, Ella Baker Center for Human Rights, California Families to Abolish Solitary Confinement, Drug Policy Alliance, Fair Chance Project, Pacific Media Workers Guild, Instituto de Educacion Popular del Sur de California, Justice Ministry Team – Evangelical Lutheran Church of America, Latino Journalists of California, Lifers’ Education Fund, Media Alliance, National Radio Project – Making Contact, Pacifica Foundation, Progressive Christians Uniting, Conservatives for Social Change, Radio Television Digital News Association, the Other Death Penalty Project, Transgender Gender-Variant and Intersex Justice, Center for Constitutional Rights, Center for Juvenile Law and Policy, Conservatives for Social Change, Critical Resistance, Islamic Shura Council of Southern California, Los Angeles Community Action Network, National Juvenile Justice Network, Office of Restorative Justice – Archdiocese of Los Angles, and the California Correctional Peace Officers’ Association, which includes prison guards and parole officers. Emily Harris is statewide coordinator for Californians United for a Responsible Budget, 1322 Webster St., Suite 210, Oakland, CA 94612-3217, (510) 435-1176, info@curbprisonspending.org. Although AB 1270, Assemblyman Tom Ammiano’s prison media access bill, has passed the Assembly as a whole and the Senate Public Safety Committee, it is currently facing opposition in the Senate Appropriations Committee. CDCR recently wrote a letter stating its opposition to AB 1270. There are two ways that you can help: Attend a Lobby Day on Aug. 9 or phone committee members from home before Aug. 13. CURB has scheduled a mini-lobby day in Sacramento on Thursday, August 9 to focus on AB 1270 and one other bill, AB 828, which would allow people with drug felonies to get food stamps. CURB is a statewide coalition of membership organizations dedicated to reducing the number of prisons and prisoners in California. We will be lobbying the members of the Senate Appropriations Committee. Everyone is welcome to participate. However, CURB cannot reimburse for travel costs this time, so you would be on your own to get there. We expect a larger turn-out from Northern California than from the South for this reason. If you decide to go, please let Emily Harris of CURB know in advance. She will be organizing this effort and will let us know logistics and details as the day approaches. Her email address is emily@curbprisonspending.org. You can call all of them or just a few. You will not be speaking with them directly but will be leaving a message. Ask to speak with the staff person who deals with appropriations matters. 1. Give your name and possibly some identifying fact, such as your job, what city or county you live in, that you’re a registered voter, relative of a prisoner, taxpayer etc. If you are a constituent of any of these senators, it is useful to state that. 2. Say that you are calling about AB 1270, the prison media access bill. 3. Say that you are urging Senator X to vote in favor of the bill in the Appropriations Committee. • It is important to have transparency in our government institutions. • It is important that we as taxpayers know how our tax dollars are being spent. 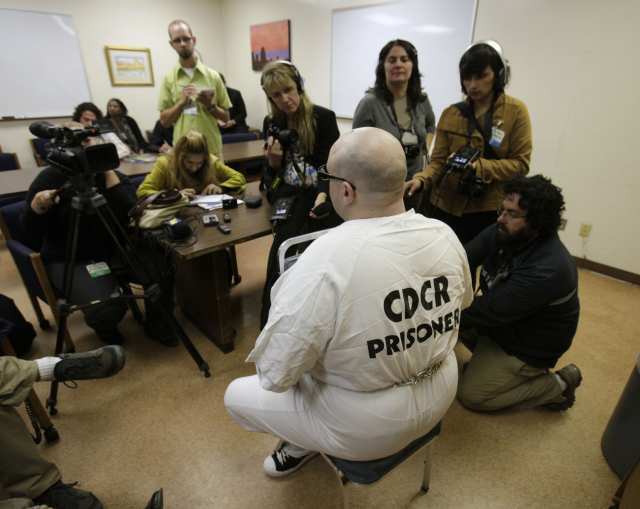 • It isn’t fair that CDCR gets to pick and choose which prisoners a reporter is allowed to interview. • The public has a right to know what is going on in our prisons. • This is an important democratic principle etc. 5. Since the Appropriations Committee deals with the budget impact of the bill, you could also address that. You could say: This bill will not cost any significant amount of money. CDCR already has public information officers to do this job. There will not be a huge increase in media requests. This will just prevent CDCR from using independent media as their public relations tool. What you say is less important than that you make the call. At the end of the day, the senators’ staff will report to the senator that the office received X many calls in favor of the bill. Period. These calls should be made as soon as possible and before Aug. 13, when the committee will be voting. With your help, we hope to get over this hurdle. Once out of Appropriations, we expect it to pass the whole Senate without difficulty. Then all we will need is the governor’s signature. More on that later! Carol Strickman, staff attorney for Legal Services for Prisoners With Children, 1540 Market St., Suite 490, San Francisco, CA 94102, (415) 255-7036, ext. 324, fax (415) 552-3150, can be reached at carol@prisonerswithchildren.org.